CHICAGO—One year ago, on May 23, 2017 Hip-Hop DetoxX Live (HHD Live) was introduced by the Honorable Brother Minister Louis Farrakhan on a Nation of Islam national webcast at Muhammad University in Chicago as part of “Social Unity Night,” an activity initiated by the teacher of the Most Honorable Elijah Muhammad, the Great Mahdi, Master Fard Muhammad. 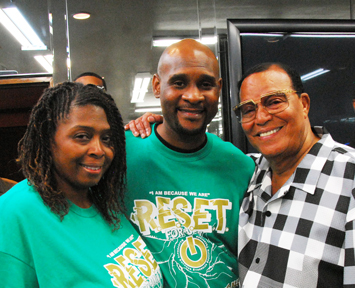 Social Unity Night was re-introduced as a regular activity among the members of the Nation of Islam. The re-introduction of Social Unity Night is designed to bring registered and unregistered members of the Nation of Islam together to foster a sense of belonging, togetherness and common unity. During last year’s HHD Live, which was recently re-broadcast on May 22 and May 23 on the Hip-Hop DetoxX Facebook Page was themed, “R.E.S.E.T. & UBUNTU “I AM BECAUSE WE ARE” and promotes artistic and cultural practices, designed for behavioral change. This national webcast was 10 years in the making as the idea originated from a meeting between Minister Farrakhan, hip-hop artist D.A. Smart and myself in 2007 regarding the work of Hip-Hop DetoxX in Chicago schools and neighborhoods. Today, as we move forward we are encouraging all mosques and study groups around the country to increase activities on Tuesday’s so the unwrapped talent of Nation of Islam members and those in the neighborhood can become more known and utilized for positive purposes. In the future, we look to feature and profile lyrics by artists taking time to put their thoughts into poetic prose so that we may be encouraged, motivated and doing more to clean up our lives and the lives of our families so we will have the power to make our neighborhoods clean and decent places to live. For more information and to watch the rebroadcast, visit https://www.facebook.com/HipHopDetoxx. For More information on how to be part of Hip-Hop DetoxX & the cultural collectives work around the country, call (773) 563-4315 or email hiphopdetoxx@yahoo.com.